This book received a lot of publicity some time back but I had no interest in at the time. I have to confess in having essentially no interest in it now, except for that I am not at home with my personal library and this is what I found available to me; so I read it. Grogan has a very funny sense of humor, I thought. I laughed outloud several times while reading this book. 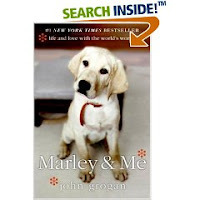 It's the story of the Grogan's family life with their beloved (and incredibly disobedient) labrador retriever named Marley. Or, rather, it is mostly about Marley. A large majority of the book is about the Grogan's family life as well -- including portions you'd rather not know about. Grogan, while funny, is sometimes a bit crass. This is definitely not a "dog lovers" story for anyone under the age of . . . I don't know. In other words, don't blindly hand this book over to your 13 year old. Maybe even your 15 year old. It contains topics which are better left unread at any age. This is a story about a dog that you will either love, for the dog's charm and personality (ah hem), or you will hate (for the disobedience factor). Grogan does a good job of poking fun at Marley as well as of himself. He takes you through Marley's puppyhood to old age. There was a lot of love for Marley in the Grogan home, no matter what anyone else might think of him. I found this story entertaining at best, crass at worst, and definitely not something I'd choose to read given another option. But since I didn't have one, I'll take the laughs and stick this book back on my SIL's shelf. Oh dear, I recently bought this book. It sounds like one I might read but won't want to keep. That's what libraries are for. But I enjoy a good laugh so I'll look for that.